The U.S. Air Force spends millions of dollars replacing the 1970s-design wingboxes of C-130E and C-130H aircraft every 20 years or so. If the wingboxes were made of CentrAl, it wouldn't need to replace them. 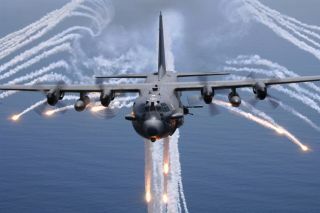 Here, an AC-130H Gunship aircraft from the 16th Special Operations Squadron out of Hurlburt Field, Fla., jettisons flares as an infrared countermeasure. A new compositematerial that contains layers of aluminum and glass fiber could save operatorsof transport aircraft many billions of dollars in maintenance and operatingcosts, researchers say. The U.S.aluminum giant Alcoa, materials-technology company GTM Advanced Structures andscientists at Delft University of Technology in the Netherlands have patented afiber metal laminate (FML) called CentrAl reinforced aluminum, or CentrAl, foruse in aircraft manufacture. CentrAlprovides some 25 percent more tensile strength than high-strength aluminumalloys, is extremely resistant to metal fatigue and is highly damage-tolerant,said Rinze Benedictus, chair of the Department of Aerospace Materials at DelftUniversity of Technology. At the sametime, it is so light that a transport-aircraft wing made from a combination of CentrAland aluminum -- which is better than CentrAl at resisting the compressionstrains on surfaces such as upper wingskins -- would not only be much strongerthan a wing made from carbon-fibercomposites, but also could be 20 percent lighter, said Benedictus. "Wethink you can save 600 to 800 kilograms in a large aircraft (over carbon-fibercomposite) -- we estimate that the saving could be around 15 to 20 percent ofthe weight of the wing," he said. This hasn't been proved, because nobodyhas yet made a wing using the new material, but it is likely that a wing madeusing CentrAl would be much easier to repair and maintain than a carbon-fibercomposite wing. Similar inconcept to the Glare material that Airbus is employing extensively in the upperfuselage and leading edges of stabilizers inthe huge A380, but incorporating thicker laminate layers, CentrAl startswith layers of glass fiber/epoxy sandwiched between layers of aluminum. Between thefiber and the aluminum are layers of a proprietary resin-rich material that itsdevelopers call "BondPreg." These layers cause the aluminum to adhereto the glass fiber and also help to spread stress loads evenly throughout thelaminate. Thick layers of advanced aluminum, attached strongly to the CentrAllaminate using BondPreg, form the outside of the sandwich. CentrAl is"very crack-resistant," said Colonel Robert Fredell, militaryassistant to the chief scientist of the U.S. Air Force. In test panelssimulating lower wingskins, fatigue cracks from artificial saw cuts grew 10 to100 times slower in CentrAl than in conventional aluminum structures, even atstress levels 25 percent higher. Soresistant is CentrAl to metal fatigue that Air Force scientists are consideringusing it to replace structures in many of the service's aging transportaircraft -- particularly the hundreds of LockheedMartin C-130 tactical transport aircraft that it operates. Air Force,Reserve and Air National Guard units operate C-130s intensively in harsh environmentssuch as Iraq and Afghanistan. Some of the 1970s-design structures in olderC-130Es and C-130Hs require major structural inspections every 100 flighthours, said Fredell. He estimatesthat using CentrAl to replace aluminum in fatigue-prone areas of the C-130,such as its lower wingskin, could save the U.S. Air Force at least $20 millionin maintenance costs on every new C-130 throughout its life. With theC-130, "there's a history of replacing the center wingbox mid-life, afterabout 20 years," said Fredell. "Unfortunately, we replace it with thesame thing we remove" -- a 1970s-design, fatigue-prone aluminum wingboxthat often needs replaced again a decade or two later. Every timethe U.S. Air Force replaces a C-130 center wingbox, it spends up to $8 millionremoving the aircraft's wing. Additionally, every six years each C-130 requiresa major overhaul that the U.S. Air Force calls a "Program DepotMaintenance." Equivalent to a "heavy 'D' check" on an airliner,each overhaul costs the U.S. Air Force millions of dollars. However,with CentrAl, "the technology exists to build a wing skin where the firstinspection that needs to be done is at least 50 years into the aircraft'slife," said Fredell. "So, as the aircraft ages, you don't need toincrease the frequency of inspections. Effectively you end up with a structurewhere the pilot does a (pre-flight) walk-round and, if a fork-lift hasn'tcrashed into the aircraft in the night, just powers it up and takes off." The mosteffective use of CentrAl would be in manufacturing new aircraft, he said. Operatorsthen would obtain maintenance and operating cost savings throughout eachaircraft's service life. But, thoughthe Air Force and other arms of the U.S. military continue to receive new C-130Js,there are no plans to use anything but traditional 7000-series T6 aluminum alloysin their construction. Nor are there plans to re-wing older C-130Es and C-130Hswith wingboxes made of new materials. This is understandable: The U.S. militaryservices have enormous experience with the 1970s-era aluminum materials thatare used to make their C-130s and many other aircraft. "Weknow the devil -- but the devil is extremely expensive," said Fredell. Giventhe research that has already been done, particularly in Europe, it would onlytake $20 million to $40 million to develop a new wingbox for the C-130 made withCentrAl, he added. While theidea of using CentrAl "is still a proposal, not a plan," the AirForce Research Laboratory is funding Boeing, Lockheed Martin and NorthropGrumman through its Materials Affordability Initiative to conduct initialstudies into characterizing and demonstrating the material. The C-130 probablyprovides the most compelling case for the U.S. Air Force to use CentrAl, but theFairchildA-10 Thunderbolt II -- affectionately known as "the Warthog"because of its less-than-glamorous looks -- offers another useful opportunity.Hugely effective in U.S. Air Force service, A-10s are now being given mid-liferenovations to extend their useful lives for decades. If CentrAl wasemployed in making even a tenth of the commercial jets on order, airlines wouldsave billions in maintenance and operating costs annually, said Benedictus,noting that the manufacturers of two new Russian regional jets plan to use thematerial. Meanwhile, theA350 XWB isn't fully designed yet. Has Airbus shown interest? "Nocomment," he said.